The Far Cry franchise is known for addressing issues of moral ambiguity in its stories. Far Cry 4 is no exception, looking at conflicts and rebel factions from a morally relativistic approach. With the Golden Path, what we wanted to achieve was this idea that even though they’re the good guys, they’re kind of muddled about how they should achieve their aims. So the player will be able to choose which leader of the Golden Path they’re following. They both want to target Pagan Min, but how they do it, why they do it, and what the consequences will be are radically different. There isn’t even a good or bad side in the Golden Path; both leaders have their reasons for why they do what they do, and they are feuding with each other. It’s more of a disagreement between old and new rather than good and bad. 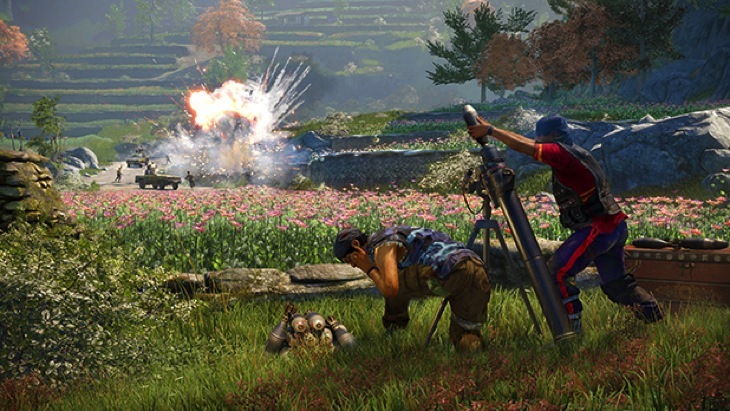 One leader might be hoping to get rid of Pagan Min to preserve the old ways, something seen as repressive in a modern world, while the other leader wants to bring Kyrat into the modern era by embracing the weapon and drug trade. Player choices will affect the story, missions and even tools at your disposal. Prepare to feel stuck in the middle of this feud as you play, forced to make decisions with no real sense of which one is right or wrong. I really enjoy this idea of moral ambiguity – even when fighting against a clear villain there can be moral choices that leave us feeling uncomfortable. This fits with current affairs, as well as just general human psychology. I’m sure Far Cry 4 will be a ton of fun – does it really get any better than weaponized elephants – but it’s nice to see that the story will be quite deep and complex. Next article These new DOCTOR WHO clips and images take us into the Dalek!